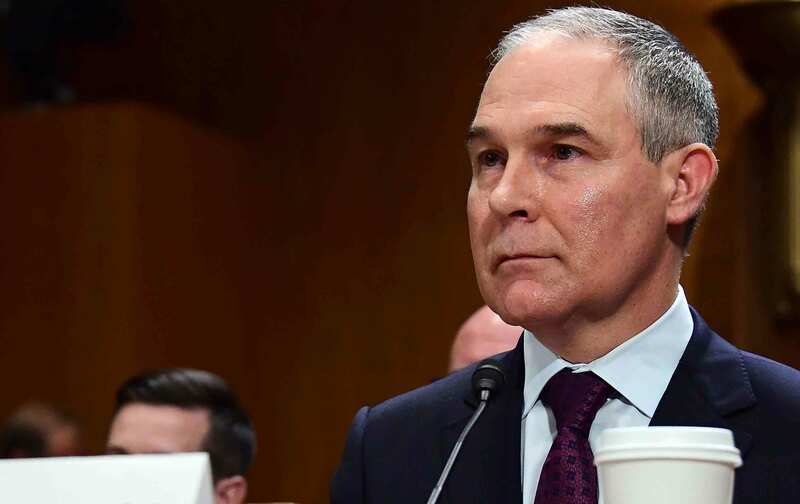 At his confirmation hearing, the nominee to lead the Environmental Protection Agency struggled to identify cases in which he’d stood up for environmental and health protections. But Pruitt was hard-pressed to identify cases in which he’d stood up for environmental and health protections and against corporations. One of the environmental successes he cited in his opening statement concerned pollution in the Illinois River watershed from chicken manure. When he assumed office, Oklahoma was suing several major poultry producers in an attempt to get them to pay for the damage and change their waste-dumping practices. Pruitt, who’d received at least $40,000 from executives at the poultry companies in question during his election campaign, told the Senate Environment and Public Works Committee that he resolved the lawsuit by crafting “an historic agreement to clean up that river.” In reality the agreement was toothless, as The New York Times reported recently, amounting to a decision to “conduct a study of the appropriate level” of pollutants in the watershed. Pruitt was asked repeatedly about his cooperation with energy companies in suing federal agencies, and in sending letters they’d written under his own name, while also collecting significant campaign contributions from those same businesses. In his defense, Pruitt argued that what was good for industry was good for Oklahoma’s economy and its people. It was New Jersey Democrat Cory Booker who challenged him most successfully on this point. Booker asked if Pruitt knew how many children in Oklahoma have asthma; he didn’t. The figure is 111,000, or one in 10. Booker pointed out that the vast majority of lawsuits Pruitt filed against the EPA were efforts to undermine limits on air pollution, which directly affects asthma. “You’ve been writing letters on behalf of polluting industries,” Booker said. “I want to ask you, how many letters did you write to the EPA about this health crisis?” He continued, “I want to know what actions you’ve taken in the past six years in your capacity as protector of the welfare of Oklahoma citizens to protect that welfare of those 111,000 children. Did you ever let any of them write letters on your letterhead to the EPA?” The answer, of course, is no. Pruitt claimed that he would not have had standing to do so, because there hadn’t been an injury to the state. “Injury?” Booker shot back, incredulous that 111,000 asthmatic children wouldn’t be considered as such. Later, when California Senator Kamala Harris asked Pruitt if he’d ever taken a corporation to court for violating environmental laws, he searched through the papers on the table in front of him to find a list he’d provided to the committee, finally naming a suit against Mahard Egg Farm. But that suit, like most of the others on his list, was initiated before he took office. Another case he mentioned, against ConocoPhillips, was a financial-fraud case, not an environmental suit. Pruitt made other attempts to soften his record on environmental health threats, particularly on climate change and mercury. On Wednesday Pruitt claimed he to be “concerned” about mercury, and acknowledged that the neurotoxin is “very dangerous.” A few years ago, however, he sued twice to block mercury regulations, arguing in one filing that “the record does not support EPA’s findings that mercury…pose[s] public health hazards.” On climate, Pruitt conceded in his opening statement that “the climate is changing and human activity in some manner impacts that change.” He also said that the EPA does have an “obligation” to regulate carbon dioxide, and that he would enforce a 2009 decision that classified carbon emissions as a danger to human health (which he’d sued to overturn in 2012). But Pruitt hedged it all by insisting that the the extent of human impact on climate is “subject to continuing debate and dialogue.” That’s simply not true—there is broad agreement within the scientific community that human activity is the primary driver of climate change, and that we should do something about it. Pruitt’s testimony, and his record, does not instill confidence that he will, once confirmed to lead the EPA, which is likely. Failure to exercise the EPA’s authority will have real consequences for human health. Just as Pruitt’s hearing was beginning on Wednesday, the National Aeronautics and Space Administration and the National Oceanic and Atmospheric Administration announced that 2016 was the third year in a row to shatter global temperature records. The Times reported, “Temperatures are heading toward levels that many experts believe will pose a profound threat to both the natural world and to human civilization.” According to a major report released by the White House last year, those threats include 11,000 premature deaths each year from extreme heat waves, the spread of infectious disease, malnutrition, and depression. Pruitt’s supporters speak of restoring balance between industry and regulation; the truly dangerous imbalance we face is ecological.